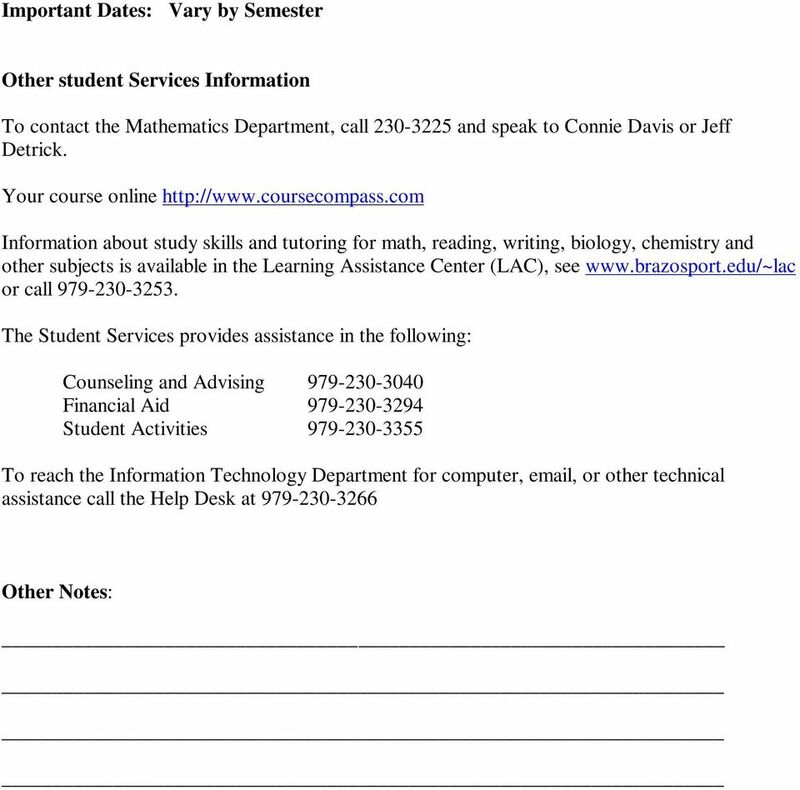 Download "Brazosport College Syllabus for Math 1314 College Algebra"
1 Brazosport College Syllabus for Math 1314 College Algebra Instructor: Cristina Bacica Office: L-203 Phone: Fax: Cell: (text only) Office hours: To be provided Course Description and Prerequisites Complex numbers; solution of equations and inequalities; graphing techniques; functions including polynomial, rational, exponential, and logarithmic; systems of equations; theory of equations; applications of algebra. Course Goals Upon completion of the course, the student will be able to: 1. Perform arithmetic operations with complex numbers. 2. Find all complex solutions to a polynomial equation. 3. Solve equations containing radicals. 4. Solve non-linear inequalities. 5. State the domain of a function in interval notation. 6. Graph a function using transformations. 7. Find the composition of two functions. 8. Find the inverse of a one-to-one function. 9. Find the slope, intercepts, and graph of a linear function. 10. Find the intercepts of the graph of a polynomial function. 11. Find the domain and graph of an exponential function. 12. Evaluate a log function. 13. Use log properties to simplify an expression. 14. Solve exponential equations. 15. Solve log equations. 16. Solve exponential applications. Textbook and Course Materials In lieu of a textbook you need to purchase MYMATHLAB. 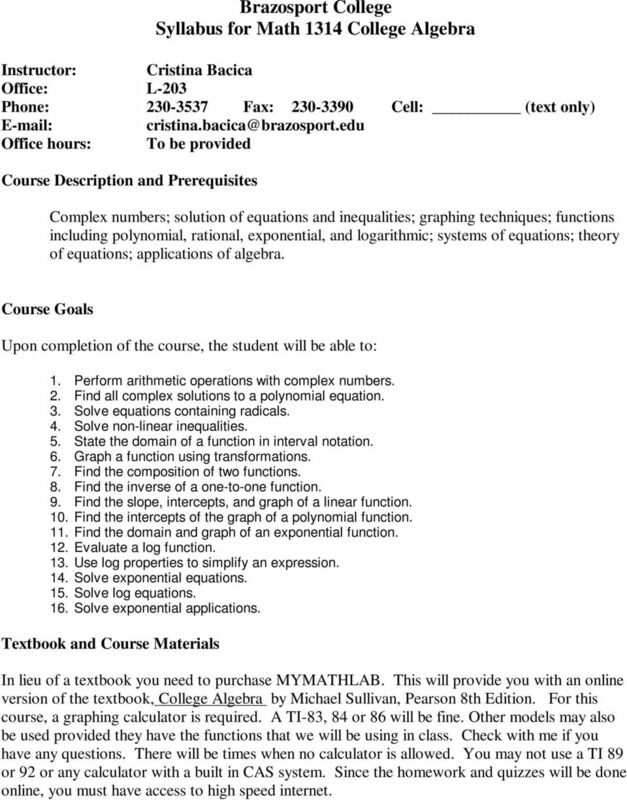 This will provide you with an online version of the textbook, College Algebra by Michael Sullivan, Pearson 8th Edition. For this course, a graphing calculator is required. A TI-83, 84 or 86 will be fine. Other models may also be used provided they have the functions that we will be using in class. Check with me if you have any questions. There will be times when no calculator is allowed. You may not use a TI 89 or 92 or any calculator with a built in CAS system. Since the homework and quizzes will be done online, you must have access to high speed internet. 3 firm. You will not be able to access it after the due date. Grades will be assigned as follows: A= B=80-89 C=70-79 D=60-69 F= below 60 Attendance and Withdrawal Policies: Regular class attendance and punctuality is expected. More than 1 week of absences is considered excessive. I will take attendance but I will not drop you for not coming to class. If you miss a class, it is your responsibility to find out what you missed. You may also want to me or a classmate through Course Compass/MyMathLab. The calendar portion of MyMathLab will help you keep up with assignments and quizzes. You are responsible for keeping up with the online quizzes. If you must wish to withdraw from the class, you must do so by the withdrawal deadline. The responsibility for this paperwork is yours. 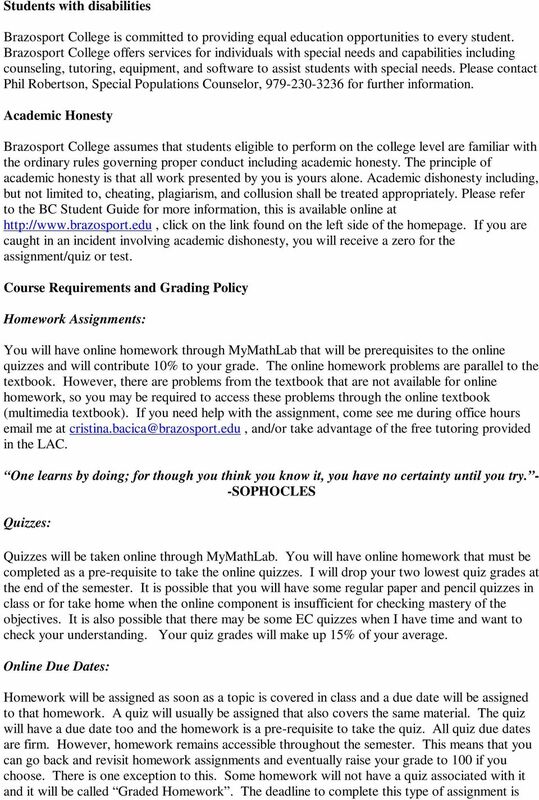 Student Responsibilities Check your MyMATHLAB calendar and home page often. Make sure you know when homework and quizzes have been posted and when they are due. Also check your daily in order to receive announcements from me. Use your text that is available online as you would a hard copy. Students are expected to fully participate in the course. The following criteria are intended to assist you in being successful in this course. a. understand the syllabus requirements b. use appropriate time management skills c. communicate with the instructor d. complete course work on time, and e. utilize online components as required. In addition, I expect each of you to behave in a way that provides for the most positive learning environment for all of the students in this class. This would include making every effort to be on time to class and prepared for class. Please turn off your cell phones during class and keep them put away. If your behavior detracts from the learning environment, you will be asked to leave the classroom and conference with me before being allowed back into the class. Schedule You will receive a tentative schedule for this class. 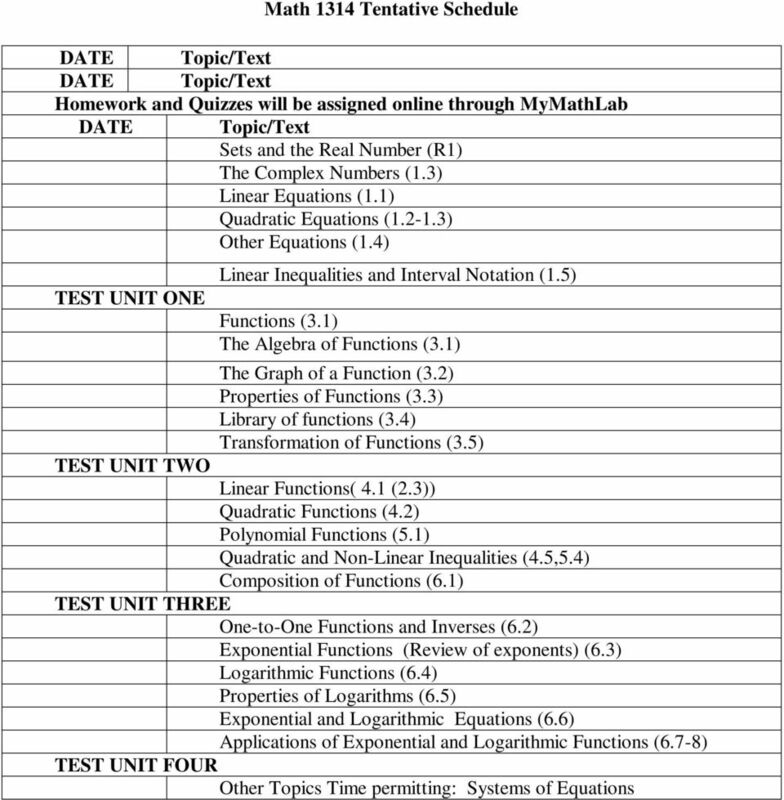 The topics that we will cover each week are listed according to the section number of the textbook. 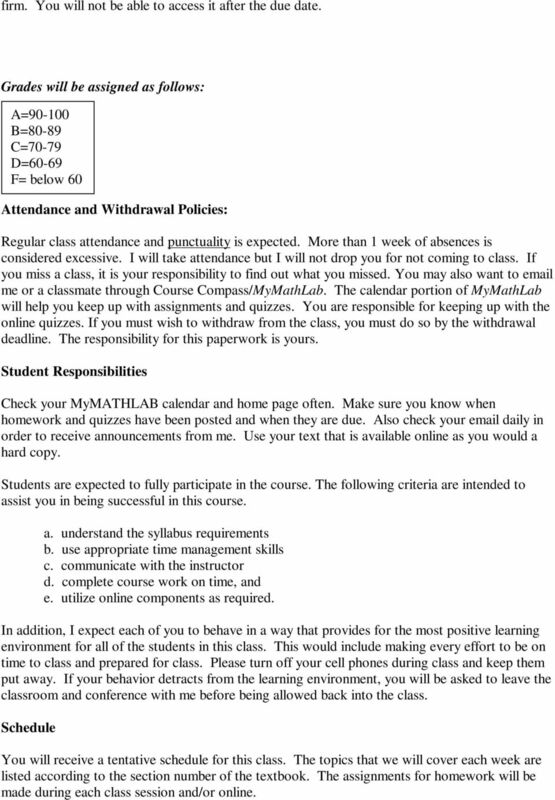 The assignments for homework will be made during each class session and/or online.